Our act was the story of women fighting under the oppressive subjection a of a male ruler set to Renaissance music. The use of some magic sparkle dust, cunning and female resolve freed our female performers from their ruler. 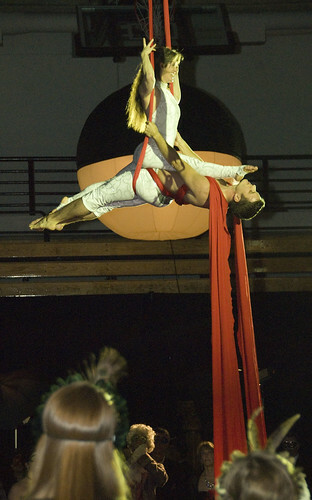 Cori, Cirque Vancouver was an independent performer and also assisted with the Artistic Direction for this event, along with David Anderson under The Circus Aerials Society. This Gala Fundraising event for the Douglas College, New Westminster, BC was called Masque Royal. This elegant evening dinner had a Renaissance theme. We had the pleasure of entertaining our guests while they dined on a sumptuous meal while attired in lovely renaissance outfits and masques. This Renaissance-themed ball which celebrated the 40th Anniversary of Douglas College and 25th Anniversary of the Douglas College Foundation - eased money for students in need.